In response to a federal lawsuit filed by the American Civil Liberties Union in September against three state troopers accused of violating the rights of an East Hartford (CT) man who was warning motorists about a DUI checkpoint, the state police union released a statement alleging that the video supporting the lawsuit is doctored. But since the union made that allegation, describing the video as “deceptively edited,” it has refused to make anyone available to back up the statement. State police union president Andrew Matthews could not be reached for comment. The union’s staff lawyer, Mark Dumas, could not be reached for comment despite repeated emails and phone calls. The ACLU filed the lawsuit against Troopers John Barone, Patrick Torneo, and John Jacobi in U.S. District Court in Hartford on behalf of Michael Picard, the 27-year-old East Hartford man who was detained, searched, and charged by state police in September 2015 after he was seen warning motorists about a state police drunken driving checkpoint in West Hartford. Picard later posted online at Youtube his video encounter with state police, saying it was only edited for time. Picard explained that he removed portions of the video where nothing substantial occurred but didn’t alter it in any other way. The video in question was filmed on Sept. 11, 2015, after Picard was approached by three troopers while he was protesting a state police drunken-driving checkpoint in West Hartford. 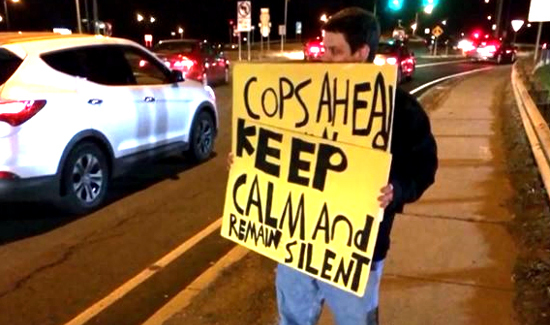 Picard held a “cops ahead keep calm and remain silent” sign as he stood on a raised median about 700 feet from the checkpoint.